Attend All Eight KingstonCitizens.org Educational Forums and Become a KingstonCitizens.org Fellow! Do you want to become a KingstonCitizens.org Fellow? Sign-up in advance to attend all eight of our upcoming educational forums in 2017. Deadline to do so is Friday, February 24th. Only 15 spots available! See our schedule below. A “reserved” seat throughout the 2017 educational forum series. Become an expert! A free education on all presented topics including information on local and NYS policies and laws as they pertain to these subjects. Two of our “fellows” will be selected randomly to win a free year subscription to a local newspaper of their choice. …and perhaps more surprises as we go along. Write to Rebecca Martin at rebecca@kingstoncitizens.org with “KingstonCitizens.org Fellowship” in the subject line. 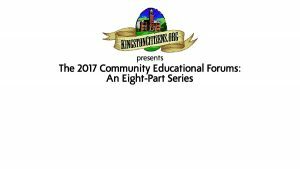 For more information, VIEW: KingstonCitizens.org Host Eight-Part Educational Forums in 2017. A discussion on the Ulster County Legislature’s upcoming Resolution No. 138 “Creating A Policy To Maintain A Safe, Inclusive Government And Ensure The Protection, Order, Conduct, Safety, Health, And Well Being Of All Persons In Ulster County,” with guest panelists District 7 Legislator (Kingston) Jennifer Schwartz Berky and Ulster County Sheriff Van Blarcum. Other guests TBA. The discussion will review this and other local proposals using the guidance provided by Attorney General Schneiderman and the ACLU to help communities understand their rights under the proposed changes in Washington. 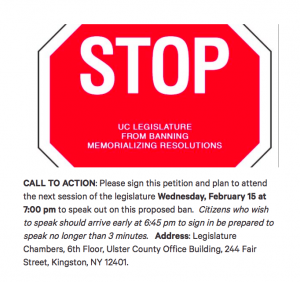 WHAT TO EXPECT: Ulster County Legislature Meeting February 15th and the Proposed Ban on Memorializing Resolutions. Please click on the image and for full size hand out. Print, and bring with you on Wednesday night. that you do not support a ban on memorializing resolutions. Legislature Chambers, 6th Floor, Ulster County Office Building, 244 Fair Street, Kingston, NY 12401. 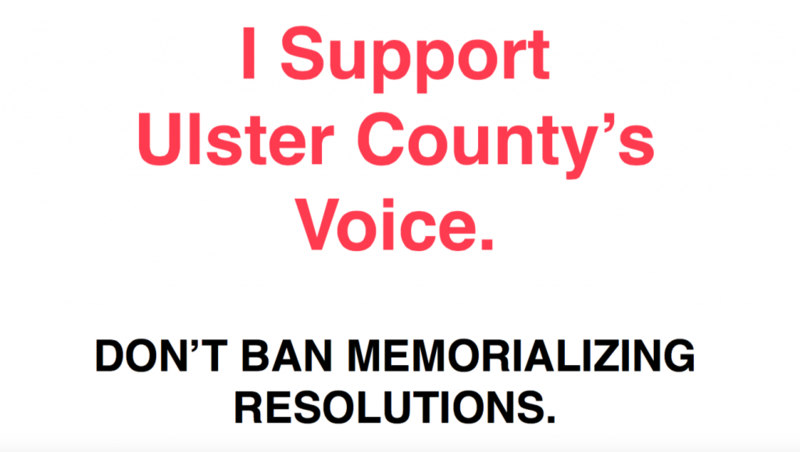 Tell Ulster County Legislature That A Proposed Ban on Memorializing Resolutions is Undemocratic. WHAT IS A MEMORIALIZING RESOLUTION? A memorializing resolution does not set forth policy or law. Instead, it creates text to cause people to remember. It is a tool to both educate and in this case, to remind us of our principles and values. So why would members of the Ulster County Legislature want to “prohibit” this critical tool? In our opinion, it is incredibly short sited and potentially damaging to county governance. Such a ban is rare in legislative bodies. Memorializing resolutions state a legislative body’s position on an issue that may be outside its purview without taking direct action. However, they represent a significant opportunity for regional leadership and intergovernmental relationships. In the past few years, the Ulster County Legislature has passed three memorializing resolutions on the proposed Pilgrim Pipeline and one on the proposed anchorages of crude oil on the Hudson River. In the last year, the legislature has been unanimous in its support of these statements, which add to the voice of an entire region that stands against these potentially hazardous projects. Citing the recent use of memorializing resolutions as a “mockery” by the democrats, Chairman Ronk pointed to Legislator Jonathan Heppner’s (D-Woodstock) resolution opposing the repeal of the Affordable Care Act (ACA) as having not being relevant to county business. With approximately 20,000 residents now relying on the ACA for their healthcare coverage and the potential loss of $3 million in federal Medicaid funding, this is certainly the business of Ulster County. Please sign our PETITION and plan to attend the next session of the legislature Wednesday, February 15 at 7:00 pm to speak out on this proposed ban. Citizens who wish to speak should arrive early at 6:45 pm to sign in be prepared to speak no longer than 3 minutes. Address: Legislature Chambers, 6th Floor, Ulster County Office Building, 244 Fair Street, Kingston, NY 12401.